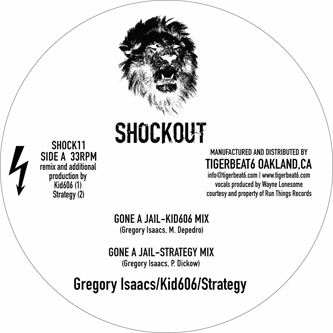 Tigerbeat's ragga excursions imprint Shockout is ressurected with a slow burner from Kid606 + Gregory Isaacs. Isaac's softly dubbed vocals ride kid606's reflective acid steppas riddim inna minimal style, while strategy fleshes the elements out in contrast to the moody 606 dub. An altogether happier cut, strategy's rework is much more floor friendly and would sound excellent pumped through some proper bassbins. I can see mashit's DJ C version receiving the most interest though, rolling amen edits compliment the subheavy b-line perfectly for a chopped and screwed floor masher to suit any occasion.